In 1973 Carmen met Yeslam and all seemed right with the world. It was a carefree time when it seemed that to be young and in love was the peak of human joy. She was the daughter of a Persian mother and a Swiss father and had spent her childhood shuttling between the sterile safety of Switzerland and the unreal world of spoiled family visits to pre-Revolutionary Iran. Yeslam was just the handsome, intelligent, amusing, well-off guy with whom she fell in love. She never really thought about what it meant to be in love with a member of one of Saudi Arabia’s most powerful families at a time when only the Saudi Royal family carried more clout and influence than the family of Sheikh Mohammed Bin Laden. It’s hard to imagine a more conversation stopping name than Bin Ladin. Short of introducing yourself as Mrs Hitler, there’s probably no surname that would carry a heavier burden today. On September 11th 2001 when Carmen and her daughters were in Switzerland, they heard the news of the attacks on New York. Her eldest daughter lived in the USA and had just graduated. Little did she realise that the press would soon be claiming that her daughter had been ‘tipped off’ about the attacks and was in Switzerland to avoid them. Carmen knew instantly that carrying the name Bin Ladin was a dangerous thing and found that as the only Bin Ladin/Laden with a telephone number listed in Europe, she was soon the target of journalists the world over. At that time she was separated from but still technically married to Yeslam. Soon her lawyer handling the divorce case dropped her and her daughters – the Bin Ladin name was just too much to handle. It took Carmen 14 years to win freedom from the family for herself and her daughters. She’s very discreet about the divorce, she says little negative about her husband (just that he became more distant) but she’s clearly a very lucky, very brave and very relieved woman to have escaped from the clutches of the Bin Ladens. 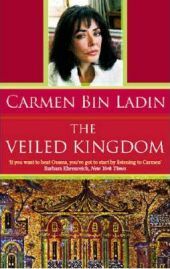 In writing The Veiled Kingdom, she set out to lift the lid on what life in Saudi Arabia as a member of the Bin Laden family had been like and to establish that she and her daughters wanted nothing to do with her ex-husband and his relatives, most specifically his younger brother Osama. She must have taken great risks with her personal safety and that of her three daughters – risks that only become apparent to us as readers as we get deeper into her account of life in a gilded but rather tacky Saudi Arabian cage. Yeslam was son number 10 of Sheikh Mohammed but with more business training and common sense than many of his older brothers he became a lynch-pin in the family organisation, one of the world’s largest construction firms. When Yeslam and Carmen married she tells us they were not particularly wealthy by family standards with just 15 million dollars or so (gulp) but this increased to around the half billion mark as his business interests grew. Whilst Carmen could go to Paris and pick up $60,000 dresses without having to think about the costs, there seemed little point when she was living in a land where she couldn’t leave the house alone and uncovered. The story is simply – girl meets boy, falls in love, marries him……and goes to live in Saudi Arabia. That’s where everything gets bizarre. If you’ve ever read ‘The Handmaid’s Tale’, Margaret Atwood’s classic story of a dystopian future in which women exist only as the possessions of men, you’ll recognise that the naming of mothers as merely ‘Om Yeslam’ or ‘Om Obama’ – i.e. mother of Yeslam or mother of Obama – isn’t so far from Atwood’s characters Offred and Ofglen being named according to who owns them. With a carefree life of freedom behind her and a relatively progressive and supportive husband, Carmen struggles for all the little independences and freedoms that her sisters-in-law don’t have; to talk directly to the workmen who are messing up the laying of her carpets without being told “I don’t take orders from women”, to be unable to greet a brother-in-law at the door without first covering her face, to have to send her daughters to a school where they are taught to hate Jews and to want to destroy Israel even though they don’t know where Israel is or who Jews are. If you’re going to marry a Saudi, it’s undeniably better to marry a wealthy one whose name can open doors and prevent the customs people checking your parcels too closely and one who can afford to take you out of the country for a few months every year. Even so it’s clear that no amount of money can buy what Carmen wanted – to give her daughters a western life, to not have to hide her thoughts from others, and to have control of her own life. Osama Bin Laden was not someone she spent much time with and most of the family looked up to him for being so religious but didn’t particularly want to spend too much time with him. She recounts one tale of a family visit to the mountains in the heat of the summer whilst her daughter and one of Osama’s sons were both young babies. Whilst her daughter was constantly drinking water from a bottle, Osama’s wife was crying because her tiny son wouldn’t take water from a spoon. Carmen offered her a spare bottle but the wife refused. This little boy was at real risk of death through dehydration because his father pronounced that using a rubber teat was haram (forbidden). This is only one of myriad examples of absurd adherence to the Wahabi form of Islam, a version of the religion that aspires to bring back the rules of the 7th Century. There’s other abuse that’s not about religion but more about control – when Carmen is pregnant the third time, Yeslam insists that she abort the foetus because he only wants two children. Carmen’s free thinking Westernised husband is getting lost under the influence of life in Saudi Arabia. You might expect a form of sisterhood between the wives but none seems to exist. Carmen had particular problems relating to the seemingly passive but very manipulative Saudi-born wives. What woman can trust another woman when her husband can divorce her on a whim and take her children away? Carmen recounts multiple tales of women getting divorced and losing all contact with their children – even one losing her son to kidnappers sent by their father. And who can forget the Saudi princess murdered under the instructions of her grandfather for refusing a forced marriage to a much older man – that was the event that caused a scandal when British television aired the documentary ‘Death of a Princess’ way back in the 1970s. During her early years in Saudi, Carmen just assumed that these extreme ways were a phase, something that would pass. Surely as oil money flooded the country it would bring with it more relaxed attitudes and behaviour. Sadly she was wrong. Instead the aftershock of the 1979 Iranian Revolution rippled through the country bringing about ever more repression and aggressive attacks from the religious police. Rather than become more free, many women started to wear thick black gloves to cover even their hands. I could go on – the book is just stuffed with examples that will make you gasp with horror about how a country that likes to appear civilised can abuse other human beings. Read it and you’ll see what I mean. And whilst I’ve reviewed other books about Saudi – The Consequences of Love by Suleiman Addonia and Girls of Riyadh by Rajaa Alsanea, there is something special in having a no-holds barred honest account of what it’s like to be an outsider caught inside an extreme system. Carmen’s writing is simple, straightforward, honest and without airs and graces. You can’t help but feel that despite the shocking things she’s written, there must have been many worse things left unwritten to protect the people involved. Stylistically it’s a simple read – she’s not the greatest of stylish writers but content-wise it’s far from being an easy read. My prejudices about the Saudi Arabian system have long been fixed and this book only reinforced my attitude to this abhorrent regime. I applaud Carmen for being brave enough to tell us what she lived through – and strongly suggest she consider changing her name as soon as she can. No Comments on "The Veiled Kingdom"